Today's Times of India is full of reports about how doctors in private practise in Mumbai are no longer going to honour cashless policies from patients who have been insured by public sector insurance companies. This is a battle ( doctors and hospitals versus insurance companies) which was simmering for a long time, and has now come to a head. Let's look at this dispassionately. It's the doctor's duty to provide medical care to his patients. However, paying for this medical care is the patient's responsibility. Typically, this was a "fee for service" model . The doctor provided the services, and the patient paid for them. If the patient could not afford to do so , the doctor would reduce his fees - and even offer free services for poor patients who were deserving of financial assistance. However, as medical costs increased, and patients found it difficult to afford these, health insurance companies stepped into this picture. The job of the insurance companies was simple - it was designed to protect the patient from the financial pain of paying for his medical care when he fell ill. This worked because the company would pool risks from the entire community. They would collect premiums from lots of people; and use this to pay the medical bills of the unfortunate few who fell ill. The traditional model was one of indemnity. The doctor provided the services and the patient paid for them . The patient would then submit the medical bills to the insurance company, who would then reimburse these bills. The doctor did not have to deal with the insurance company because his only task was professional - to provide medical care to his patient. This was simple and beneficial for all parties concerned - so far, so good. However, as time went by, two changes crept in which corrupted this system. 1. Doctors and hospitals started getting greedy. They would inflate the bills they would provide to patients who had insurance coverage and then share the spoils with their patients. Many doctors and patients were happy to indulge in this practise. They felt that they were milking a large faceless, heartless insurance company, so no one was getting hurt ( the moral hazard fallacy) , while they were profiting handsomely ! In fact, some patients felt entitled to getting reimbursement from the insurance company every year ; and would plot with doctors to submit fake medical bills even when they were not ill, just so that they could get this money from the insurance company. Their justification was - " We are paying a premium every year , so why shouldn't we get some money ? And anyway, the insurance company can afford this ! How will a few thousand hurt them ? " In all fairness, the insurance companies also took a stand which encouraged this padding on the part of hospitals and doctors. They would take an inordinately long time to reimburse legitimate hospital bills; and would find many flimsy reasons to delay the payments due - and even to refuse payment altogether. They did this because they wanted to make money on the "float" - and the longer they delayed the payments they owed to hospitals, the more the money they could make. When hospitals found out that it was taking insurance companies 3 - 6 months to pay them their rightful dues, they started padding the submitted bills even more, to try to recover some of their rightful dues. Sadly, as more and more doctors and hospitals started indulging in this malpractise, insurance companies found they could no longer afford to overlook these losses, which were proving to be a drain on their profits ! They start scrutinising these claims and did their best to plug these loopholes. However, this was a difficult task; and was made even more difficult by the fact that health insurance was provided only by Public Sector companies owned by the Govt of India. They were allowed to collect artificially low premiums from their clients, because health was seen to be a social good, and the government was reluctant to charge realistic market-prices for these policies. All the players did their best to reduce their losses , but since they were forced to do so within the artificial constraints set by the government, everyone was unhappy. 2. As the health policies continued to lose money , insurance company executives started to think of new ways of reducing their losses. They realised that doctors were padding their claims and submitting inflated bills for insured patients. They decided to negotiate fees directly with hospitals and doctors; and since they had a lot of clout, they turned the screws on doctors by forcing them to accept capped fees for each procedure - fees which the insurance company set; and which the doctor was forced to accept. Since doctors did not have any unity and they did not want to lose their patients, many quietly agreed to toe the insurance company line. 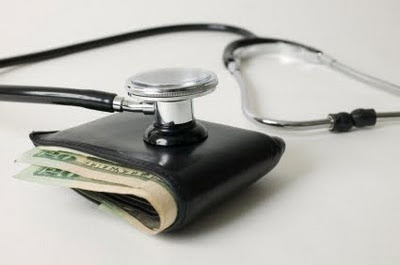 While the initial fees which were set were reasonable ( the company would ask for a 10% discount on the typical market fee for a procedure), the insurance companies started to act as bullies and continued to progressively lower the fee, year after year, until doctors could not afford to treat their patients at the abysmally low rates which the insurance companies were offering. This was the flash point, which has triggered off the crisis which exists today ! The tragedy is that everyone is hurting today. Originally, medical insurance was supposed to be a win-win situation. Doctors were happy, as their workload increased. Patients who would not have been able to afford to pay them their fees originally could now afford to have surgery done in private hospitals, because they had insurance coverage, and the insurance companies had deep pockets. Patients were happy, because they could afford to get good quality care in private hospitals, without paying a bomb. Insurance companies were happy, because they could collect the premiums and make money on the float. However, because of some rotten apples, the entire health insurance business has now become confrontational ! Doctors are unhappy because insurance companies refuse to pay them their full professional fees. They are willing to pay only a pittance, and doctors find that they cannot survive on such low fees. Insurance companies are unhappy because they continue to make losses on their health policies. If they go on bleeding , how will they be able to continue to provide health insurance policies ? Where will the money to pay the doctor come from ? Patients are unhappy because they find themselves trapped between doctors and insurance companies. Insurance companies are happy to collect the premiums on the policies - but when it's time to pay the medical bills, they create an endless series of barriers and hurdles ! And when the doctor refuses to honour the cashless policy the insurance company has provided, patients feel angry and cheated. So what's the solution ? Right now there's a lot of blustering and posturing going on. Doctors are trying to get organised, which is good. However , the AAMC ( Association of Medical Consultants in Mumbai) is threatening to penalise those of its members who continue to accept cashless policies. This is a completely toothless threat ! The AAMC is a private organisation for doctors, which some doctors choose to join. All the AAMC can do it cancel the doctor's membership - not an action which is likely to worry most doctors ! So what's next ? I think things are going to get a lot worse before they get better. The present antiquated model is broken, and we will have to come up with innovative new solutions. The good news is that these models do exist ! The US healthcare industry is also a mess right now, but there are many clever initiatives which have been piloted by some smart people there , and we can learn from these. introducing consumer driven health care plans, such as Health Savings Accounts. This crisis is actually an major opportunity - and entrepreneurs who craft win-win solutions will do very well ! Dr Malpani your analysis is very correct. From a win-win situation the mediclaim industry now is a lose-lose situation where none of the partner is happy. But the basis of calculating premiums and running a profitable business model rests with the insurance companies. I have a 5 lac policy, as a consumer, and if i want to avail a treatment from a well reputed consultant working in ,say leelavati hospital, why should i be denied my right for a cashless claim of 1 lac when I am paying premium for 5 lac. Where is my fault as a individual policy holder? AND mind you, all these restrictions have been made for individual policy holders only and not for corporate policies. This is because the insurance companies know that they can squeeze a common man who does not have enough time, resources and legal firepower to fight against them. It's heartening to see that a doctor in India recognizes the inherent "slippery slope" problem of medical insurance. Thank you for that clear analytical summary. Hopefully you can find a solution before it becomes entrenched there as it is here in the U.S.